Aroma Hotel has 12 Luxury rooms offering a wide range of choice from the Presidential Suite to Deluxe rooms, all backed up with unparelled service and hospitality. All rooms are equipped with Internet Broadband connectivity and other services like Travel desk, 24 hrs rooms service, Laundry, doctor on call, safe lockers etc. 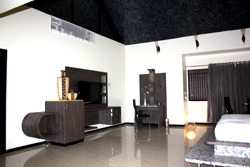 Presidential Suite is a luxurious suite for those who do not want to compromise on luxury. 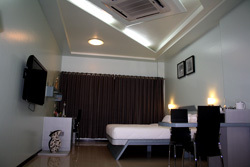 The suite has a seperate living room apart from the spacious bedroom. It also has a spacious open to sky private terrace garden. Alongwith other facilities like Cassette air conditioners and 42" LCD with Direct D2H, the Presidential Suites is also equipped with Large Jaccuzi and Safe Lockers. Jaccuzi, Safe Lockers, Minibar, Weighing Machine etc. Executive Suite is so spacious and luxurious that you will not feel like stepping out of your room. It also has a smaller size private terrace garden and all the amenities available in the Presidential Suite. The room is designed in the Eqyptian Pyramid architectural style. Large Jaccuzi, Safe Lockers, Minibar, Weighing Machine etc. 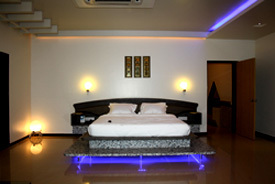 Super Deluxe Rooms offer a 'great value for money' experience. These rooms offer luxury at a very reasonable cost. Super Deluxe rooms are also equipped with Jaccuzi. 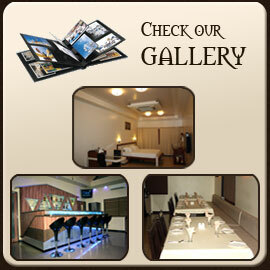 Deluxe Rooms are decent and offer luxury at affordable prices. 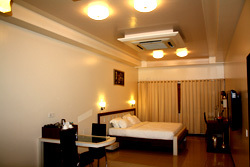 Deluxe Rooms are also Cassette Air Conditioned and have all the common facilities like 42" LCD with Direct D2H, Safe Lockers. 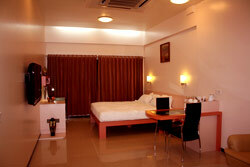 Deluxe rooms are available in two color options, pink and blue. Safe Lockers, Weighing Machine etc. 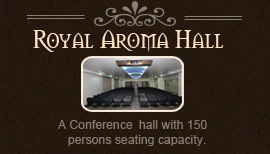 Rooms | Gallery | Restaurants | Conference Hall | Contact | Booking © Copyright 2011-2012 Aroma Hotel, Latur.